$0.33 Crayola Crayons 24-Pack at Toys R Us | A Savings WOW! Here’s a HOT deal on Crayola Crayons (which are on many school supply lists). 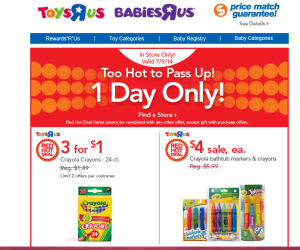 Today only, get the 24-packs for only $0.33 each at Toys R Us. This is an in-store deal. If you don’t find it in your Toys R Us store, you can also price match at Walmart. This is a good stock up price. Plus, these are great to donate to schools, preschools, and are always handy to have to keep kids from getting bored. Thanks The Real Frugal Divas!